A group of EpiPen purchasers have filed a class-action lawsuit against drugmaker Mylan over the increase of EpiPen prices by around 574%. Hagens Berman has filed the complaint on behalf of purchasers, which stated that Mylan has increased the list prices 17 times from $90.28 to $608.62 since it acquired the rights to market and distribute the EpiPen in 2007. As per the complaint, the affordable drug that costs pennies to produce is now out of reach for many patients due to quid pro quo arrangement between Mylan and other players. The lawsuit also claims that Mylan has failed to disclose that the skyrocketing increases in the list prices for EpiPens were due to the payment of rebates to pharmacy benefit manufacturers (PBMs). According to the suit, some firms tried to launch auto-injectors to compete with EpiPen when list prices for EpiPen were increasing dramatically. Hagens Berman, managing partner Steve Berman said: “Mylan has tried every trick in the book to avoid taking accountability to the millions of people who are living without the EpiPen they need to prevent a life-threatening allergic reaction. Meridian Medical Technologies, a Pfizer’s firm and Mylan's manufacturing partner for EpiPen auto-injector, has extended voluntary recall of select lots of EpiPen (epinephrine injection, USP) and EpiPen Jr (epinephrine injection, USP) auto-injectors. The current recalled products include additional lots distributed in the US and other markets in consultation with the US Food and Drug Administration (FDA). The recall is being initiated based on two previously disclosed reports outside of the US of failure to activate the device due to a potential defect in a supplier component. 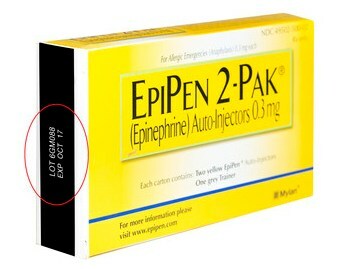 Image: EpiPen 2-Pak auto-injectors, 0.3mg. Photo: courtesy of Mylan.